DBF is the file extension for a generic database file. Since it is the native file format of dBase Inc. (later renamed dataBased Intelligence Inc.) database software, it is also called dBase. This simple file format is so popular that almost any database program can easily open, edit, and save it. A DBF file consists of fields and records organized in a tabular form. Each field contains one data type and each record has one data value for each field. The data type in the field contains the information as to the amount of physical storage to set aside and the form in which to save the data. The records are of two kinds - the header record (this contains information describing the structure of the data in the file), and the data record (this contains the actual text of the fields in consecutive bytes). The length of a record depends on the lengths of the fields. Although dBase continues to be the most widely used database management system (DBMS), several different dialects and variations of this standard have been produced by other companies. These include Visual FoxPro, Clipper, dbFast, CodeBase, MultiBase, dbXL, and Arago. Each of these uses a different file extension. 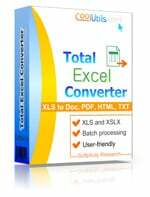 DBF files may be opened directly with Microsoft FoxPro, Multisoft FlagShip, dBASE, Clipper, and Sage Act on Windows, or converted to PDF, HTML, ODT, ODS, TXT by Total Excel Converter.